The beautiful story about Queen Esther and how she courageously saved her people from total anhilation by their enemies is one of the most amazing stories in the Bible. What faith she had in God to do what she did at great personal risk! In honor of her accomplishment, every year the Jewish people celebrate the feast of “Purim,” which is in the month of Adar. It falls somewhere between mid February to mid March. Children all over Israel dress up in various costumes, like Esther or Mordecai, kind of like our Halloween. Some even dress up like the villain in our story, Haman, and make fun of him. The facts below make for some very compelling reasons as to why Esther is a book that most definitely deserves to be included in Holy Writ. The name she was given by her parents was, “Hadassah.” It means, “Myrtle tree,” in Hebrew. 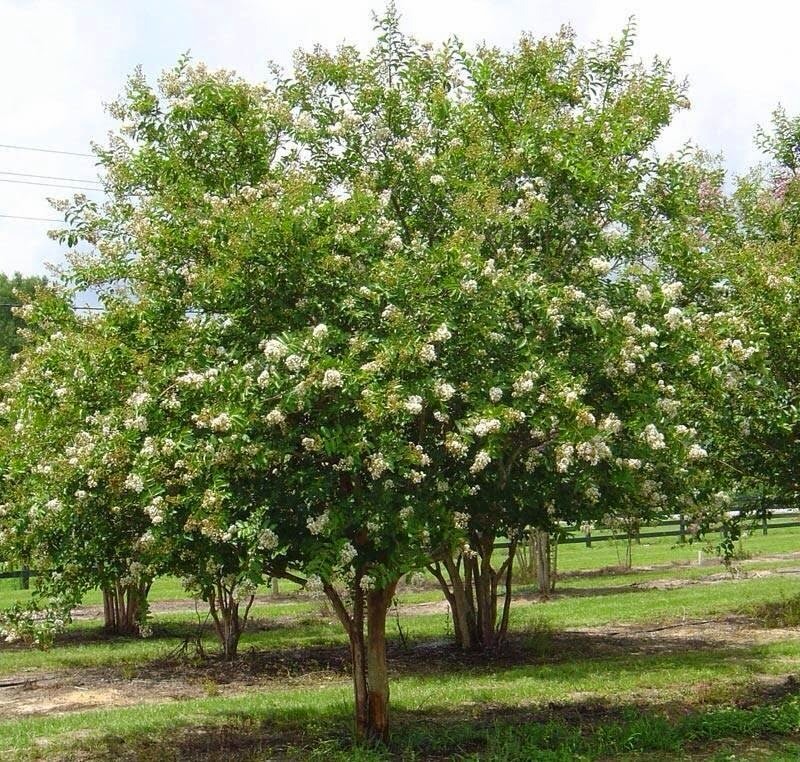 Esther, her Persian name, means “Star.” Above is a picture of one of the flower of the Myrtle tree. Kinda looks like a star, doesn’t it? 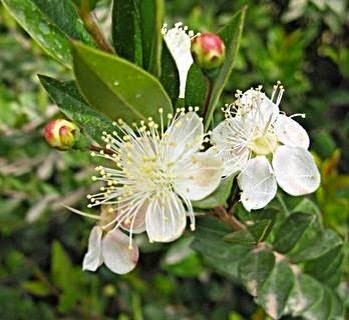 Myrtle is a beautiful and very fragrant tree. It’s white, five-petaled flower is a typology of not only Jesus’ righteousness. Because believers are IN Christ, it also typifies but our righteousness in Him. Five is also the number of grace. The myrtle was a blessing tree, used in both the tabernacle and temple, as well as during the Feast of Tabernacles. Most “Sukkah,” which is what the Jewish people call their temporary shelters during this feast, include branches from the Myrtle tree. Though Esther in the Persian language means, “star,” something bright and highly visible, in Hebrew it means, ” I hide my face.” Very telling! “16 And the LORD said to Moses: “Behold, you will rest with your fathers; and this people will rise and play the harlot with the gods of the foreigners of the land, where they go to be among them and they will forsake Me and break My covenant which I have made with them. Isn’t it curiously “coincidental,” that THE ONLY book of the entire Bible which “happens” to mean, “I hide my face,” also, as I said, does not contain any mention of the name of God? He is hiding His face! Check it out; 167 verses; ZERO MENTION OF GOD! However…..though it does not appear on the surface, you can see Him everywhere, working behind the scenes. He is either controlling events and circumstances directly or turning backward any evil intended to harm His people. 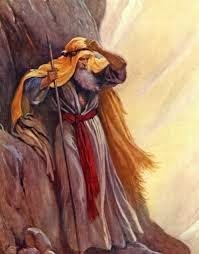 Hidden in the Hebrew text itself in acrostic form, at every crucial turning point, every critical juncture, the Hebrew text clearly shows that, although he has hidden His face, He did not forsake His people! He was still protecting them. These are the letters of His name in Hebrew: “Yahweh–[יהוה] yod hei vav hei, reading from right to left. The vowels have been added to help pronounce His name. These letters in this exact order appear in four places in acrostic form at critical junctures. It is BACKWARDS when He is OVERRULING the devil’s evil devices; FORWARD when He is RULING DIRECTLY. This, by the way, is how Bible codes are done, a phenomenon with which the Jewish rabbis are quite familiar. There are two occurrences where He is overruling; two where He is ruling directly and one where a different Name of His stands alone. That is five times in all, the number of GRACE!!! Secrets hidden in Hebrew letters and messages in acrostic form may be new to us but they were originally discovered by Jewish rabbis long before Jesus came to earth. The unpronoucable, unspeakable tetragrammaton of the Name of God, “YHVH,” is a perfect example of this type of hidden message. These things are placed there for us to find and be blessed in their discovery. The first time His Name appears is in Esther 1:20. It is backwards. Hebrew reads from right to left, so if you were reading it backwards, you would read left to right. The letters that spell His Name–“Yahweh,” The Covenant-Keeping One,”–are in parentheses. It is backwards here because He is overruling, turning back Vashti from being queen so He can position His choice for Queen: Esther. You can see that God’s Name is BACKWARD–overruling man’s decisions. God’s Name, Yahweh–[יהוה]—appears FORWARD in acrostic form. 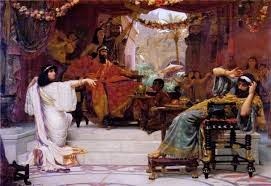 Esther thought this was her decision but it was actually God’s decision to invite the King and the evil Haman to a banquet of wine. He is initiating directly, behind the scenes, orchestrating events to benefit His people. Wine, in the Bible, is representative of the Blood of Jesus as the King in this story is representative of God. Though not perfect or “a god” by any means, he is used by the Holy Spirit in this story for the purpose of teaching us some things about God. God’s Name appears BACKWARDS in Hebrew in this phrase. God is turning back the evil designs of the devil. It was Haman’s bitterness against the Jews that God turned back on him. 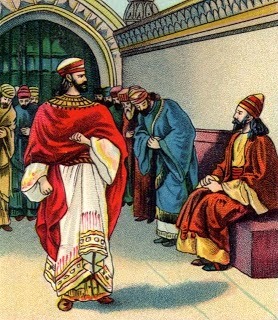 He saw Mordecai the Jew “sitting” at the King’s gate. He refused to bow before Haman. Being a Jew, he will only bow before God. Haman is a typology of satan. He hates to see you and I sitting, resting in the finished work. He wants you to get up, use the arm of flesh and your own intellect and do something. But you and I don’t need to worry or fret. We rely on God for our wisdom and direction. We move at His request. Haman, interestingly, was a direct descendant of King Agag whom King Saul had spared. He was an Amalekite. These people had, and in face, still have, an ancient hatred for the Jews. IT AVAILS THEM NOTHING. And finally, in Esther 7:7, Haman comes to realize his goose is cooked! God’s Name appears FORWARD in this phrase as God sends the evil that the devil was going to do to his people and uses it to destroy him instead. Haman is ultimately hanged on his own 50′ gallows, a picture of the devil being totally defeated at the cross! The number “50,” in Bible numerics, is the letter, “nun-[נ]. Num means, “fish,” a picture of the believer. Because of the cross, we believers have full authority over the devil! The last time God’s Name appears it is not Yahweh; it is: I AM. 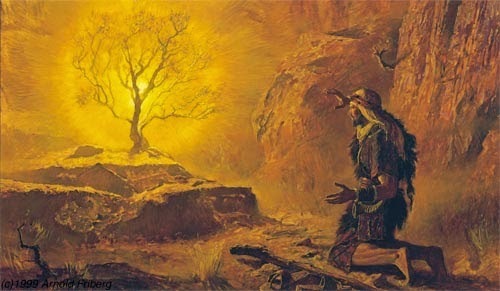 Moses at the burning bush asked God what His Name was and He said, “I AM THAT I AM:” It is that same Name here. “Who is he and where is he?” in Esther 7:5. Below is The Name in acrostic form. This is the “I AM” of Moses’ burning bush! When your “evil day”–(not “evil days,”- plural – please note) comes and it seems like God is hiding His face, HE ISN’T! Know and believe that God has provided everything you need to withstand in your evil day. Even if you feel as if He is far away, know and believe that He is working on your behalf to turn that evil “day” -singular- into “GOOD DAYS!!!”-plural! That’s God’s love letter to us, Church, in the book of Esther, also known as Hadassah!